We serve over 30,000 meals a year! Toiletries are a huge need for our community members! Please consider donating unused deodorant, toothpaste and toothbrushes, socks, underwear, travel size shampoo and conditioners, etc. for our members. Donations can be dropped off at the Eliot Church in Lowell. All donations are greatly appreciated and are tax deductible! St. Paul’s Kitchen was started in 2000 by Rose Bronk, a member of St. Paul’s United Methodist Church. 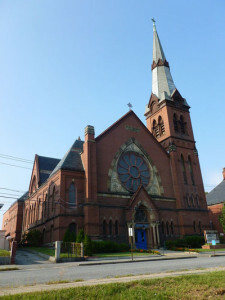 When St. Paul’s closed, Eliot Church took over as the host church. Between eighty and one hundred and sixty homeless and disadvantaged people come for a hot meal every weekday evening, Monday through Friday, 52 weeks a year, rain or shine. Food is served from 5 to 6 p.m.
Several area Protestant churches and other organizations take turns preparing and serving the meals. Serving dinner Monday through Friday at 5:00 p.m.
Eliot Church at 273 Summer St. Lowell, MA. To give to this very worthy organization please go to donate page! Thank you!